Peter Green was a familiar face for a great many people in Colchester in his fishmonger’s shop in Eld Lane, Colchester. He was always ready to chat and knew lots of his customers by name. 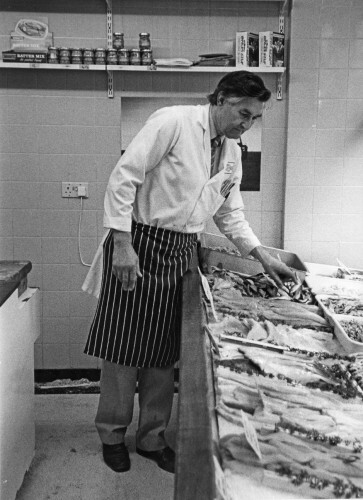 The fishmongers was started by the Green family of Wivenhoe in about 1954 as one of several businesses involving fish. Peter sold the shop in 2003 and took retirement. Peter Green is still a familiar face for people in Wivenhoe which is where he has lived all of his life. He is one of the family of Greens who are extremely well-known in Wivenhoe and who all owe their origins to Peter’s grandfather James ‘Friday’ Green who was born in Harwich in 1862 and died in Wivenhoe in December 1928. Friday Green had a large family of 8 boys, one of whom was Peter’s father, Alec Green. Peter’s brothers were Ken, Doug and Dennis.